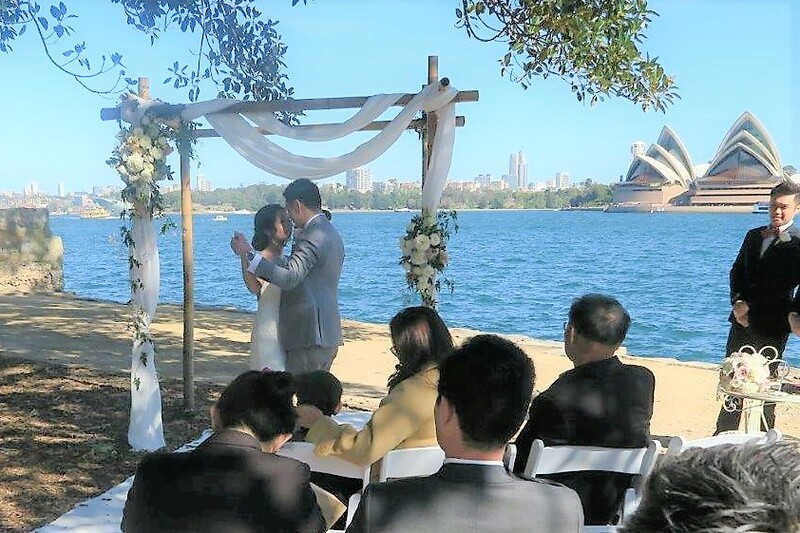 Wedding venues North Sydney – beneath Sydney bridge overlooking the harbour is Captain Henry Waterhouse Reserve for beautiful weddings. There is a famous old tree where your guests can relax overlooking the harbour with Sydney Opera in the background. A harbour wedding location is always a spectacular event. There are so many Wedding venues North Sydney and around the area. 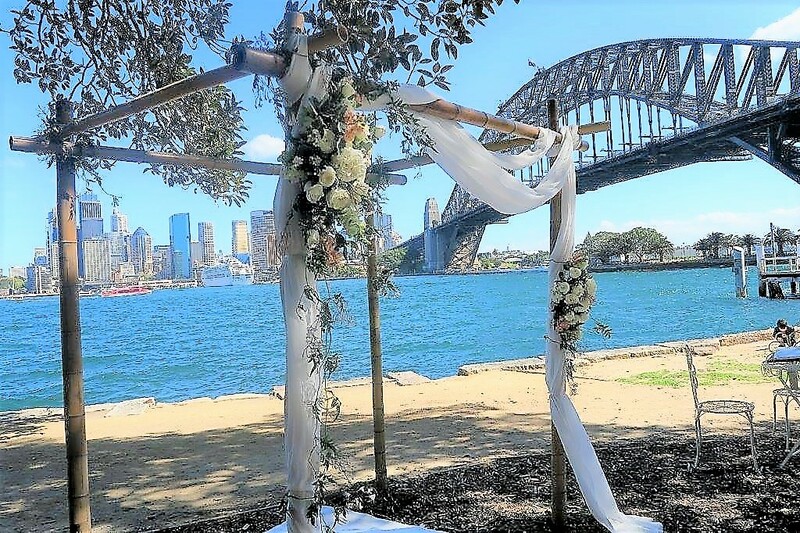 And there are so many spectacular wedding venues around Sydney harbour. But this location is just like having a beach wedding combined with an outdoor wedding and a harbour wedding ceremony. And all that in just one location on the north side of the harbour, in North Sydney. More weddings at Captain Henry Reserve. Lodgement of the NOIM form. Marriage registration & Marriage certificate. All the legal paperwork for your wedding ceremony. A great PA system so you can play your chosen music. Unlimited contact with me and my assistance for your wedding. 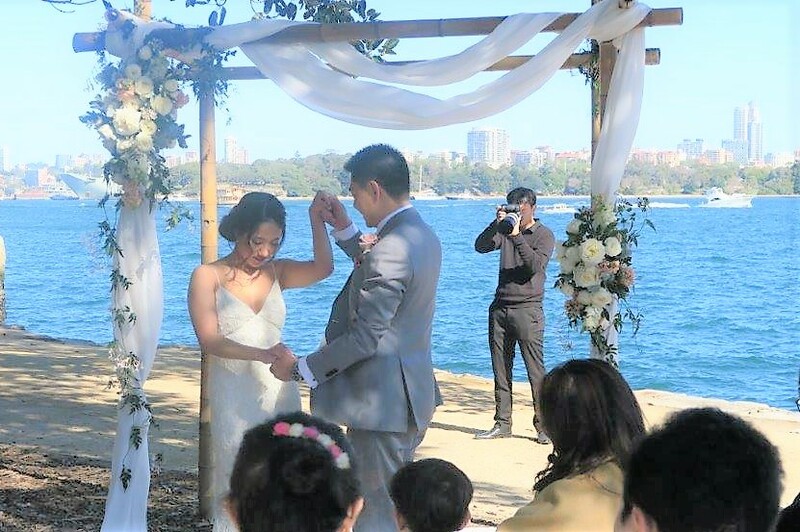 A beautiful unforgettable wedding ceremony and a stress-free journey. My complimentary package with collections of readings, poems and ideas. And why not start your married life with a fun game and a wedding dance. So this gorgeous couple, after being together for already eleven years, following the wedding ceremony have decided to start their married life first with a cheeky fun game followed by their first dance as husband and wife. The wedding game they chose is called the Wedding Shoe Game. It is when the couple sits on two chairs back to back holding one of their shoes as well as one of their partner’s shoe. Usually, the best man comes up with some funny tricky questions about the bride and groom’s life. If you think you are the answer, then you rais your shoe and vice versa. And then the couple had their first dance together as a husband and wife, with the magnificent view in the background of the whole harbour. These are just a few ways to create and personalize each and every wedding ceremony. There are many rituals, readings and verses that can be included in a wedding ceremony. Otherwise, you can just keep your ceremony short and sweet. Either way, the wedding ceremony needs to reflect you and how you want it to be. Contact me so we can start to plan and personalize your wedding ceremony too. Thanks for being the celebrant for our wedding. You have been very helpful throughout the process, including meeting us a few times to go through the itinerary before the ceremony. We would also like to thank you for suggesting some great ideas for the ceremony and for accommodating our needs. You have certainly made our special day even more special! We will definitely recommend you as a celebrant to any of our friends that are getting married. 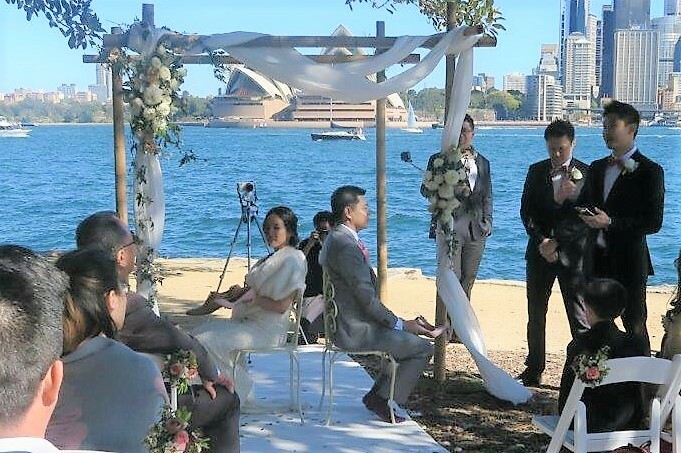 This entry was posted in Marriage celebrant, Sydney Celebrant, Weddings and tagged Celebrant Sydney, Experienced Celebrant, Marriage Celebrant, Marriage Celebrant Sydney, Wedding, Weddings.